There is almost an monastic silence as we stroll towards Monk’s Lane in the centre of Timoleague. But, open the door, and there is the happy sound of people dining. Our table is ready and soon we join the cheerful chorus. The menu is full of promise. The sandwich section uses the best of local produce: Toons Bridge, Gubbeen, Ummera. And so it continues. In the mains and salads you see O'Neill's sausages, Crozier blue cheese and Clonakilty black and white pudding. I spotted an Eight Degrees tap on the bar and that was just the start of the craft beers as a separate menu lists over a dozen of the best including the local Black’s of Kinsale. And the wine list is good too, quite a few available by the convenient (it was midday!) 100ml glass. Service is excellent, knowledgeable, chatty. The furniture has touches of the ecclesiastical and there are lovely bunches of wild flowers on the tables. It is a cold day so we start with the soups. 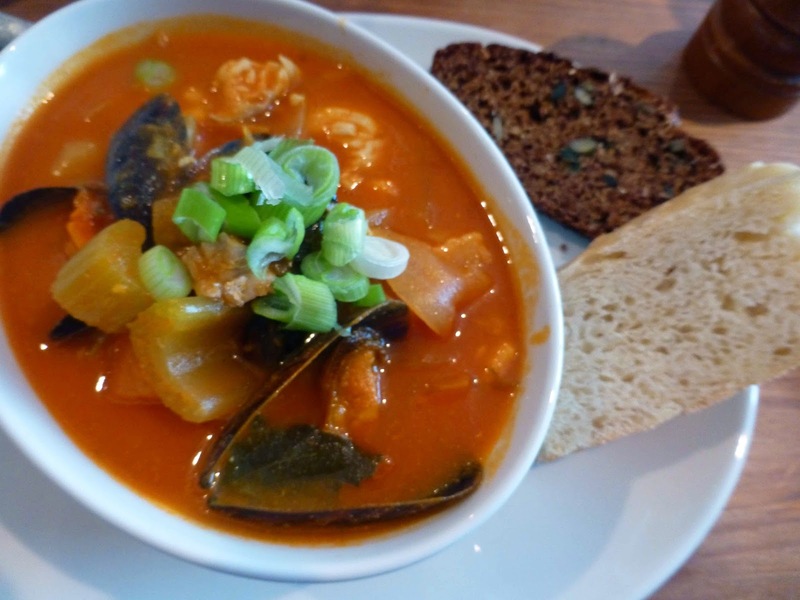 They are very simply titled: Roast Vegetable Soup (4.50) and Spanish Fish Soup (6.50). Both are excellent but that Spanish dish is a gem, packed with fish, mussels, vegetables too, and warming spice. We get real bread and butter on the side. Great start. 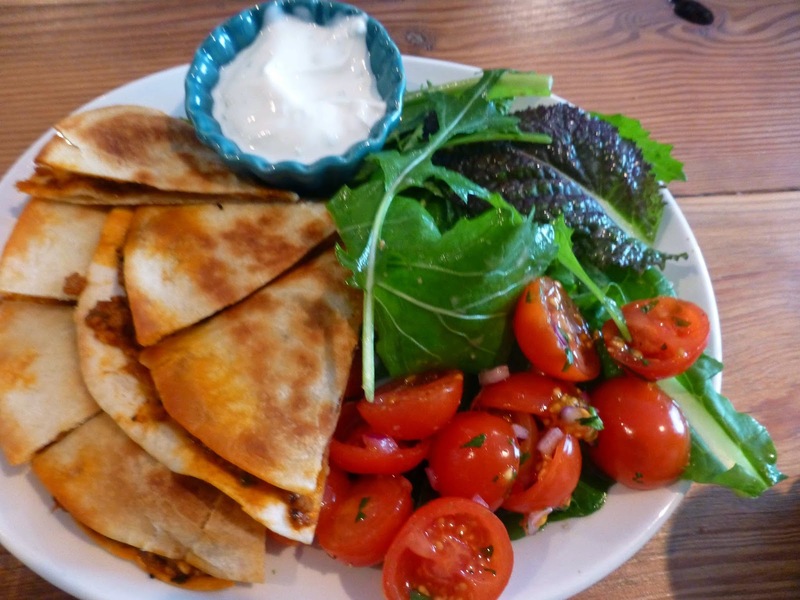 CL then goes for the Lamb Quesadillas with salad and salsa fresca. You can have a small portion for eight euro and the larger one will cost 11.50. Well cooked and presented, the minced lamb was very tasty and not too spicy (no great need to use the cooling dip). My choice was the Steak Salad and I hit the jackpot here: Seared steak salad with pecorino shavings, toasted pumpkin seeds and cherry tomatoes, all for 12.50. 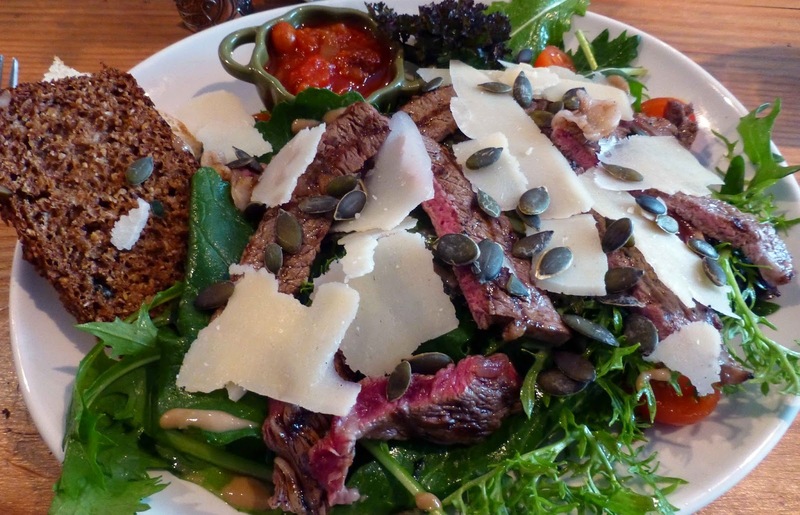 The steak, in strips, was plentiful and perfectly cooked and all the elements, including a robust salad, complemented each other in an explosion of flavours and textures. Compliments to the chef! Dessert. The usual question: would we? The usual solution: we shared. 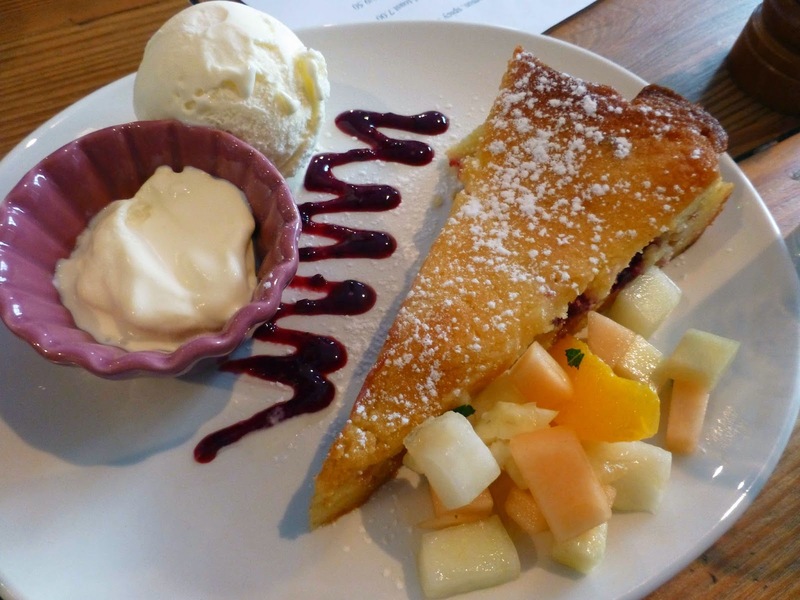 And there was plenty to share when our generous slice of Apricot and Raspberry cake arrived, surrounded by some fresh fruit cubes, cream and ice-cream! Happy out, as we say around here. We made a detour to get here. Well worth it. Very Highly Recommended.